Courtesy photo A stitched-up Snoopy is on the mend after being kicked by an unknown skier Monday on Tiehack. A dog named Snoopy received 66 stitches during the course of a three-hour surgery Monday, but his injuries weren’t because of a brawl with another canine, an attack by a wild animal or being struck by a vehicle. Instead the 50-pound cattle dog was, according to his owner, kicked by a skier in the Tiehack area of Buttermilk about one minute after Snoopy snapped loose from a leash. Three of Snoopy’s ligaments were severed and the violent encounter left what owner Danny Brown called a “bloody mess” on the slopes of Tiehack. Aspen Skiing Co., which operates Buttermilk, has a no-dogs policy during lift hours. The Tiehack lift closes at 3:30 p.m. The Summit Express lift — which runs top to bottom from the base of Buttermilk — closes at 4, meaning skiers can access the Tiehack area on the mountain’s east side. “Hikers with dogs need to be aware that there are skiers coming downhill until after 4 p.m.,” said Skico spokesman Jeff Hanle. Deputy Michael Buglione said he did not believe the skier committed a crime. 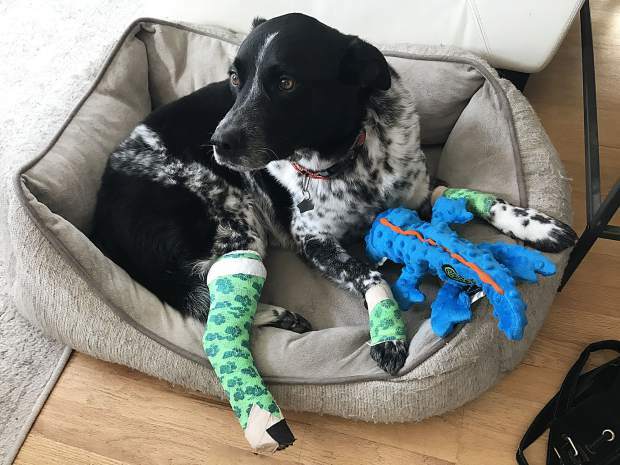 “Based on what I know, I don’t think the skier knew or was aware of the injury the dog incurred, and was just defending himself against a charging dog,” he said. Brown said the incident occurred at approximately 3:50 p.m. about midway up Tiehack. Brown was skinning up the popular route with Snoopy before he broke the leash and dashed off toward the downhill skier. The skier then went down the hill and Brown never spoke to him, he said. Worried that Snoopy was in danger of hemorrhaging to death, Brown said he removed a shirt and wrapped the dog to contain the bleeding. “He was bleeding do death,” Brown said. Brown then skied down to the base, with the 50-pound Snoopy cradled in his arms, and drove him to Aspen Animal Hospital. The skier, meanwhile, was nowhere to be found. Brown said he wanted to talk to him to discuss helping pay for Snoopy’s veterinary bills. Brown’s Facebook page described the skier as a black-haired man in his late 30s or early 40s wearing a blue jacket. The veterinary bill was about $1,500, Brown said. The incident was not caught on any of Skico’s on-mountain cameras, Hanle said.